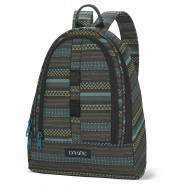 Dakine Backpacks - Dakine Prom Laptop Backpack - Ellie :: Women > Backpacks. Volume: 25 LLogo badge to frontAll over tonal floral printAdjustable shoulder straps for custom fitInsulated cooler pocketDeployable water bottle pocketSlip pocket to frontFleece lined sunglasses pocketDouble zip fastening to spacious main compartmentWomen's backpackMaterial: 100% PolyesterDimensions: (H) 46cm. (W) 30cm. (D) 23cmAdditional zipped pocket to front with double zip fastening and internal organisation pockets Size: one size.